A couple of months after a US national election is finished, and the Federal Elections Commission has updated its statistics on campaign contributions and the heat and energy has died down a bit, I like to check the invaluable Open Secrets website run by the Center for Responsive Politics for what actually happened with campaign spending. Here are a few things that caught my eye. Total spending for the 2014 Congressional races looks like it will come in at about $4 billion, quite similar to the amount spent in 2012 and 2010. In the context of a high-income country with a population of nearly 320 million, this is not a large amount. As I point out in my Principles of Economics textbook (which I naturally recommend for its combination of high quality and moderate price), "For example, consumers in the U.S. economy spend about $2 billion per year on toothpaste. 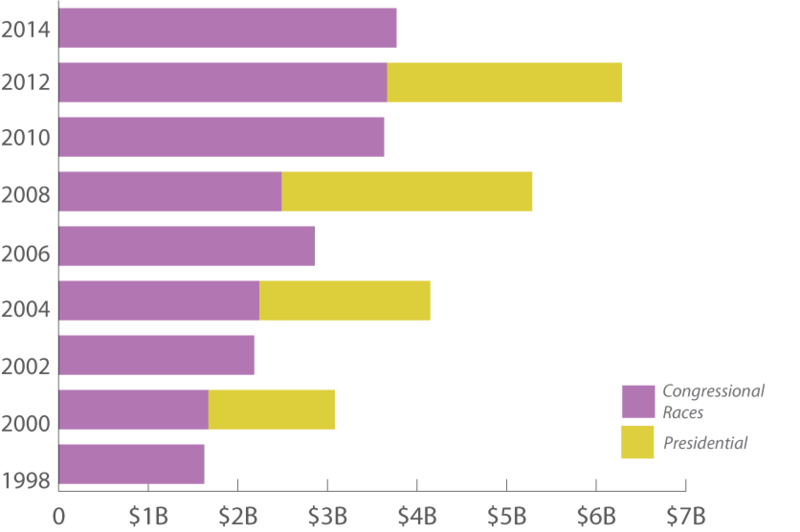 In 2012, Procter and Gamble spent $4.8 billion on advertising, and General Motors spent $3.1 billion. Americans spend about $22 billion per year on pet food—three times as much as was spent on the 2012 election." As another comparison, Americans spend about $8 billion each year celebrating Halloween. With the US government making decisions that involve $3.5-$4 trillion in spending and taxes, not to mention the nonmonetary effects of other laws regulatory rulings, people are going to allocate resources to try to affect those outcomes. What about the much-discussed role of "outside money"--that is, outside the candidates and the political parties themselves? Here's the breakdown. 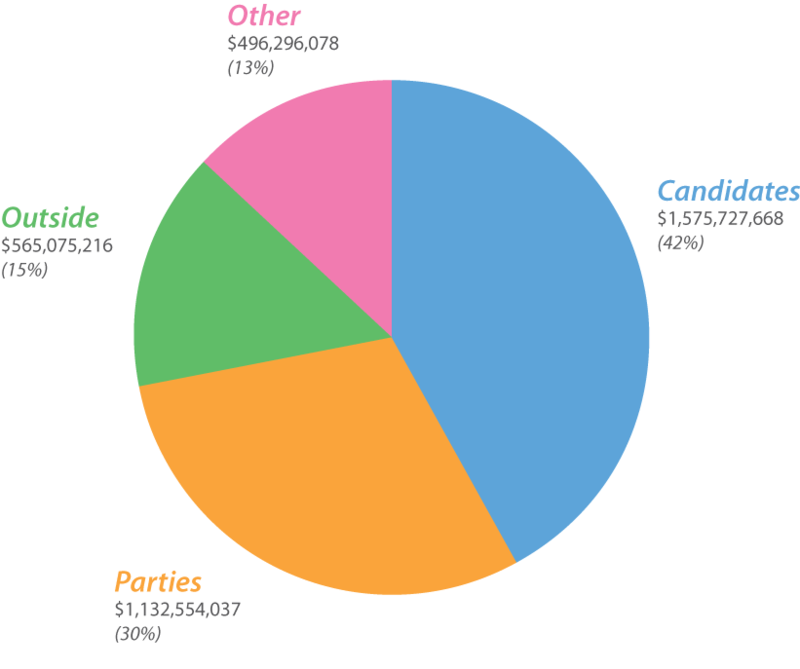 Candidates and parties still dominate campaign spending, although outside organizations surely play a significant role. Open Secrets also provides a breakdown by party, and by the House and Senate. Overall, Republicans outspent the Democrats by a fair amount in the House, and by a smaller margin in Senate races. However, a glance at the table shows that the Republicans also had more candidates early in the process for the 435 House seats and 36 Senate seats (33 on the regular election, plus three that for various reasons where a Senator did not serve out the complete term had special elections). Thus, some of this total reflects R v. R and D v. D, races, rather than the general election. An alternative measure from Open Secrets looks at the average spending per candidate, not overall. By this measure, spending by House candidated was largely equal between Democrats and Republicans, but Democratic candidates for the Senate spent more than twice as much as Republican candidates. Finally, what about the role of big organizations? There are a variety of ways of slicing the data on giving by organizations, but here's a list of the biggest 20 entries in "Top Organization Contributions." As the website explains: "Totals on this page reflect donations from employees of the organization, its PAC and in some cases its own treasury. These totals include all campaign contributions to federal candidates, parties, political action committees (including superPACs), federal 527 organizations, and Carey committees." As the list shows, these biggest organizational donors tend to lean to the Democrats. Koch Industries, which seems to get considerable public attention, is 17th in these rankings. I do worry about the role of money and media in a democracy. But I am also wary of those in government, from both parties, who want to set up rules that would limit how people or organizations can seek to affect political outcomes. Such rules often seem tailored to make it harder for incumbents to be challenged, or harder for political opponents to make their case. If politicians really want to make a statement about getting money out of politics, how about if they stop trying to limit the political expressions of others, and instead enact stronger rules that limit them from taking highly-paid jobs as lobbyists after leaving office? Frankly, I worry more about behind-the-scenes lobbying than I do about obnoxious political advertisements.